Potassium ions present in the sample react with Sodium Tetraphenylborate to produce an insoluble Potassium Tetraphenylborate resulting in a turbid suspension. There are a number of kits available for carrying out this test. 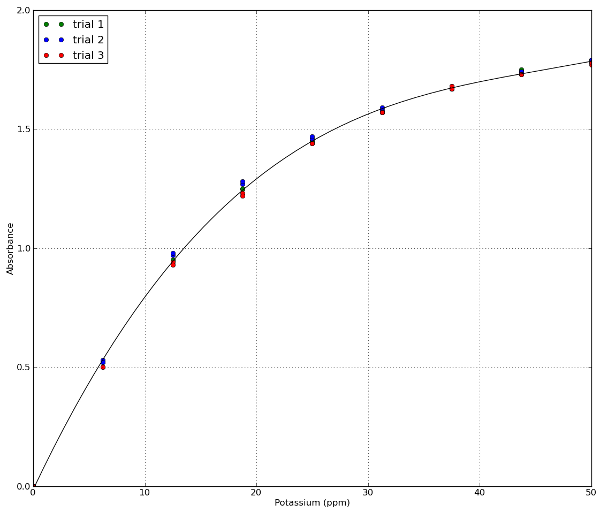 Initially we selected the LaMotte potassium kit based on price and availability of separate refill reagents. Dilute the 1,000 ppm potassium standard from LabChem (Cat # LC201007) to yield a 50 ppm potassium working stock. For each sample, weigh out 0.05g of NaTPB into a fresh 5 mL tube. I use a small Horizon PRO-20B digital balance as shown in the Image below which you can buy online from Amazon for $20-30. Add the contents of the tube to the powder, shake and let stand. Below is an image of all of the calibration points after adding the NaTPB powder. Transfer approx. 1mL of each calibration solution to a cuvette. Data from three separate calibration trials are attached at the bottom of the page (lamotte_trial1.txt etc). To view this data, download the files and open them in the colorimeter plotting software as described here. An image of the data from all 3 trials is also shown below. Select the method you wish to use from the two options below. Select Option A if you have a micropipette and analytical balance, Option B if you do not. Option B will use the additional equipment in the LaMotte test kit (measurement spoon, 15 mL sample tube and dropper bottle). Fill the LaMotte tube to the top line with water sample to be tested. Select Potassium-LaMotte from the drop-down list. The Red LED should be selected. Pour some of your treated sample from the 5 mL tube into a cuvette, place in the colorimeter and click measure. The program will return the potassium concentration in ppm.